Then a finish, Brno seeing the car finish 78 of 93 laps to claim 24th place after sitting in twelfth spot on the grid. Britains Tourist Trophy at Silverstone was even better  12th place and 100 of the 105 laps after qualifying 16th. For this race, curiously, the entrant was Sala W Racing. So as they headed to Bathurst with just one car, the poor Maserati company must have been hoping for a major reversal. It wasnt to come. Bartlett remembers that the team looked the part. They had all the flags and banners, the suits, it really looked good, he says. And at first glance the car showed promise, but both Bartlett and Riley concur that a full season of racing and developing would have been needed to mount a serious challenge at the Mount. But they didnt have the luxury of that time, and they couldnt go through the processes of homologation that would have been needed to get the parts that were required to get the car right. In reality, they found that the car had not been developed at all. Perhaps this was the result of a busy race schedule preventing the testing and modifying that was required. Perhaps it was a lack of engineering skills within the team running the cars. Perhaps it was a lack of funding. We dont know, the local input was almost an aside in a year long disaster-ridden racing campaign for the Maserati. But although it was fast, it was also fragile while so much boost was applied  the car stopped soon after with blown head gaskets. So all of this is why the bi-turbo Maserati was such a flop when it came here. And it didnt go on to compete in the Wellington and Fuji rounds that completed the series. They had had enough. But, reflecting on that speed at Calder, and the scope for improvement, the way that an Australian team with the experience and nous of Bartlett and Riley could have handled this car, its really a shame that we have to look upon it as an oddjob. The article was originally published in "Motor Racing Australia"
Racing cars tend to need to have everything going for them, for everything to be right. 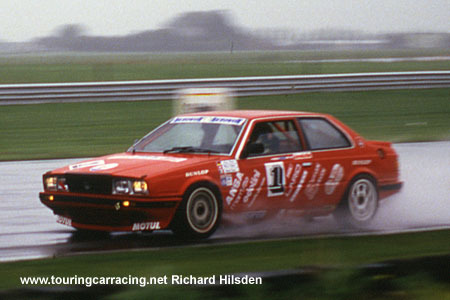 But the Maserati bi-turbo that raced in Australia in 1987 only ever went well when something was broken! 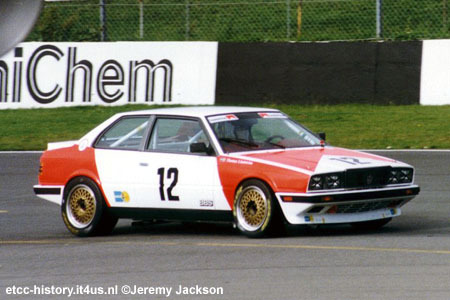 Campaigned through the 1987 World Touring Car Championship by Pro-Team/Imberti, the impact of analysing the running the Maserati bi-turbo through the year conveys nothing thats pro about the team, and thats exactly the same impression thats conveyed by discussing the cars appearances in Australia with people involved in running it at Bathurst and Calder. Yet on paper it had so much going for it. A neat car with a good footprint  the wheelbase and track were pretty close to ideal and decent wheel sizes were able to be fitted  its weight was reasonable, and the lithe engine promised plenty of power. But promise would be all that would be seen from the Maserati. Our interest, of course, stems from its races here  Bathurst and Calder hosting rounds of the title that year. And though Kevin Bartlett forgets the details of how he became involved, he was asked to become a partner to Bruno Giacomelli and Armin Hahne. Today he remembers it as a nightmare best forgotten. With suspension movement being so restricted, the car was constantly having its wheels losing contact with the road. This meant that the power would be unleashed one moment and contained the next, as the wheel came down, and stresses on components were magnified immensely. But the car had already run in seven races before arriving for the Bathurst event (or tried to  it didnt qualify for the Jarama and Spa events), wouldnt it be reasonable to expect that some sorting had been done? Indeed, it did seem good on paper. A quad-cam 18-valve V6 of 2491cc, heavily oversquare at 91.6mm x 63mm bore and stroke, twin IHI turbochargers ensuring limited lag and good low down response, it was said to have 360bhp at 6,500rpm. A 5-speed ZF gearbox, 9.75 x 16 wheels all round and a reasonable weight at 1185kg. With the fuel injection that had replaced the two Weber carburettors part way through the season, it should have been a very good thing. But at Monza, first round of the series, it had only completed 70 of the 87 laps, and qualified 28th. Then none of the three cars sent to Jarama qualified, the two at Dijon saw one make 27 of 112 laps with turbo failure cutting its run short, the second car not starting after an engine failure in qualifying. There was more promise in practice at the Nurburgring, 13th fastest, but then another turbo failure almost half way into the race. Spa was unlucky, you could say, because only one driver qualified, putting it out. But undoubtedly it was unreliability in practice that led to the second driver not getting in a good lap.